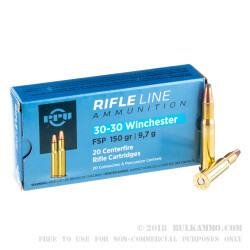 30-30 Winchester ammunition first captured Americas heart when it debuted in 1895. The Winchester 1894 Lever action rifle was ahead of the pack because this specially designed loading was Winchesters first smokeless powder cartridge design. 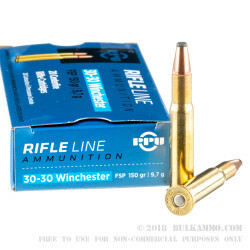 Since then, the 30-30 has remained a solid favorite among hunters, cowboy action shooters, wild west enthusiasts, lever action rifle lovers, and target shooters all over the world and the USA. 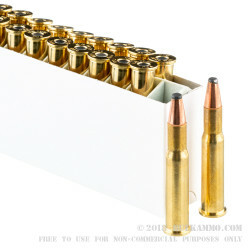 This Prvi Partizan line of ammo is now complete with the addition of the .30-30 Winchester caliber. 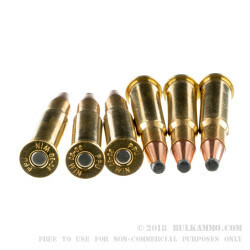 These rounds are loaded with a 150 grain, Flat Soft Point, thick copper wrapped bullet with tough lead core. Each FSP bullet has a soft lead tip that ensures reliable expansion upon impact. Each one is loaded into a new, reloadable, heavy duty, thick wall, Boxer primed non-corrosive, yellow brass case. These cartridges have a ferocious reported muzzle energy that hits at 1,880-foot pounds, and the muzzle velocity is an impressively fast 2,378-feet per second. They come packed in smaller, 20-shot boxes that are easy to stock up on, and simple to transport to the range, out for hunting trips, for plinking or testing a new lever gun, or for any cowboy shooter competition. Grab some for your safe today!